Designed in an Italian palazzo style by Adolf Cluss and Joseph Wildrich von Kammerhueber in 1867, the four-story Masonic Temple with its multicolored sandstone façade adorned with Masonic symbols still stands at Ninth and F streets NW. Cluss had joined LaFayette Lodge No. 19 of the Masons in November 1864. Work began in June 1867. The Evening Star reported that "The building committee, judging from the massive foundations (three feet in thickness) being laid, are determined on erecting a building which will stand for ages." Cluss's original drawing shows a fifth floor that was never built because, Cluss explained many years later, of lack of funds. The Masonic Temple cost $100,000, much of which was raised through the sale of stock. Cluss himself still owned shares worth $4,100 at the time of his death in 1905. 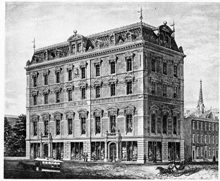 The income from first-floor shops and from the second-floor grand ballroom rentals provided dividends for stockholders. Throughout the remainder of the 19th century, the ballroom was the scene of many of the city's most important social events. When the cornerstone was laid in May 1868, President Andrew Johnson, a Master Mason, excused all members of the Executive Branch who were Masons to march with him in the parade to the site. The Grand Master presented the architect with "the implements of operative Masonry… that by your skill and taste, a fabric shall arise which shall add new lustre to our honored city. May it endure for many ages..." The building was dedicated on March 20, 1870, in ceremonies that acknowledged the architect, "who merits high praise." In the 1870s, the building was also used by the Washington Universalists for their conventions, until the congregation build its own Church of Our Father, which was also designed by Cluss. Besides the Masonic Temple, the Universalists also came together at Lincoln Hall. 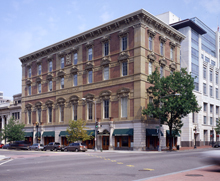 The Grand Lodge moved to new and larger headquarters in 1908, a building that now houses the National Museum of Women in the Arts. After serving as home to Strayer Business College, the 9th Street Masonic Temple was for many years an adjunct building for Lansburgh's Department Store before being abandoned and standing vacant for over a decade. Beautifully restored in the 1990s by Karchem Properties (see: www.karchem.com/projects/office/office_1.html), the building now houses a restaurant on the first floor and part of the headquarters of the Gallup Organization on the upper floors.